It doesn’t get any more American than the capital of the United States. But behind the many marble facades of Washington DC lies an international city that will keep any traveler busy from sunrise to sunset. 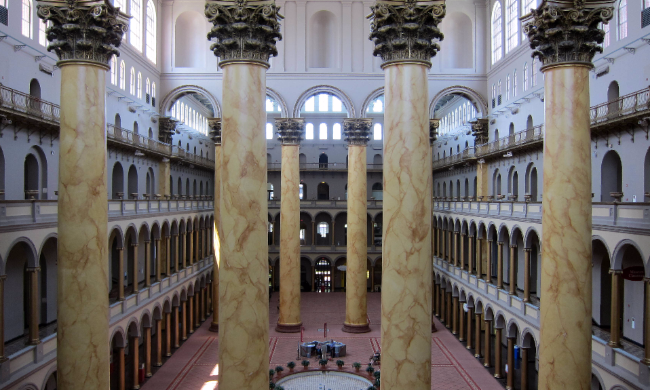 We have curated a list of the best things to do in DC in a day, and there is a lot to do! The National Mall is actually a national park that links the Lincoln Memorial to the US Congress building. It is perhaps the most recognized national park in the US, and a perfect way to see several iconic memorials, museums, and government buildings on a 1.9 mile stretch of green gardens and lawns. A walk or run through the Mall is a great way to start your day in DC. Must-see DC sites like the National Museum of American History, the Smithsonian Institution Building, the National Air and Space Museum, the Washington Monument, and the Vietnam Veterans Memorial are all accessible directly from the Mall. 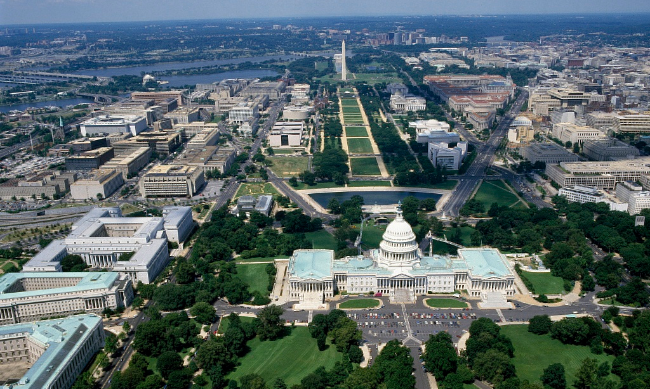 From the National Mall, you have a large array of museums to chose from. There is a museum for nearly every visitor. For those interested in American history while in the country’s capital, we recommend the National Museum of American History, which houses an impressive collection of over three million artifacts. Nature buffs should visit the Smithsonian National Museum of Natural History, which contains over 126 million natural science specimens and cultural artifacts, including 30 million insects, 4.5 million plants, and 7 million fish. The best part: they, like most museums in DC, are free for admission. Georgetown is a historic commercial and entertainment district along the Potomac River just a 10 minute car ride away from the National Mall. 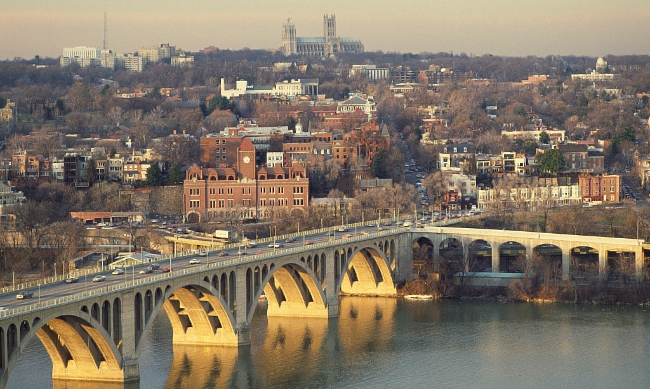 Home to the prestigious Georgetown University, it is an easy escape from the bustle of downtown DC. Go shopping or grab a bite to eat on Georgetown’s historic Wisconsin Avenue. Visit the university campus and admire its impressive gothic architecture.Explore the surrounding neighborhood of historic row houses where the likes of John F. Kennedy once called home. Movie enthusiasts can even visit the famous “Exorcist Stairs,” where a character in the 1973 horror film The Exorcist tumbles to his demise. Foodies will not be disappointed by the wide variety of restaurants and bars DC has to offer. Several neighborhoods have become hot-spots for good eats and nightlife. The 14th Street corridor, stretching from Logan Circle to U Street, is home to beer bars big and small, including ChurchKey which features over 50 craft beers, French bistros like Le Diplomate, tapas bars like Estadio and Barcelona Wine Bar, and several new restaurants that keep locals coming back for more. Located next to Logan Circle, the Shaw neighborhood has been hailed as one of the hottest and most diverse restaurant neighborhoods in DC. Here you can find brewpubs, corner bars, dive bars and beer gardens.. For food, go for Italian at All Purpose or Alta Strada/Consoci, Southern Mexican cuisine at Espita Mezcaleria, or Near Eastern at Ottoman Taverna or Shouk. Many DC restaurants also feature tasting menus for diners who want a little bit of everything. Bon apetite! 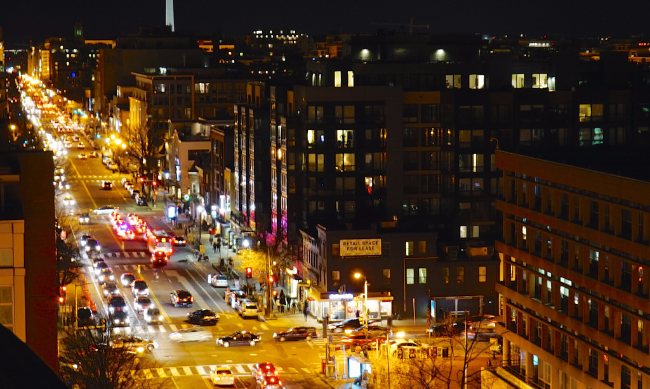 DC offers world class nightlife options for every traveler. From dance clubs, to a vibrant jazz scene, to international classical music, you are sure to end your night with something exciting. Those looking to dance will enjoy SAX, a Moulin Rouge-style two-floor bar and club that features live performances from ballet to acrobatics above the bar. There is also the Eighteenth Street Lounge, a crucial part of the DC music scene featuring live music of different genres, it is also the birthplace of the internationally renowned Thievery Corporation . 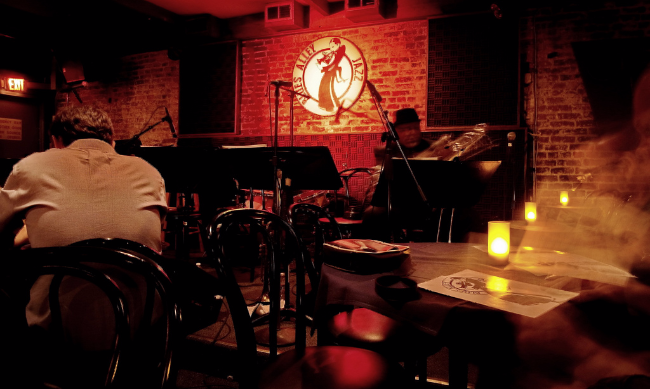 Jazz enthusiasts should visit Blues Alley, an iconic jazz club where Tony Bennett, Sarah Vaughan and Ella Fitzgerald have all performed. For those looking for classical music, there’s no better place than the John F Kennedy Center, the cultural center of the United States that focuses on classical music and jazz. One thing is for sure, you won’t be bored in Washington DC!